When compared to electric or battery-operated floor burnishers, propane burnishers provide the highest shine for commercial floors. A propane unit is considered the “heavy-duty” option of floor machines. If you’re working on a large retail store, there’s little choice besides a propane unit to maintain such a massive floor plan. These units are often walk-behind, with a 20- to 27-inch rotating base – reaching up to 3000 RPMs. Their weight helps produce a better shine. That’s the number-one reason why they’re so often chosen for commercial flooring. 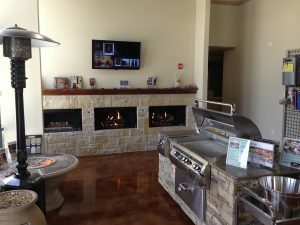 Flooring companies often select propane-based burnishers to shine their commercial flooring projects due to their high level of efficiency. While electric or battery-operated units are considered efficient enough, they cannot duplicate the unprecedented levels of a propane unit. This is due to the speed, weight, and power of a propane burnisher, all of which work in its favor. Electrical burnishers are the only units to come close to propane. This model’s greatest downfall, however, is its constant dependence on a power cord. You need to move from plug to plug as you shine a floor. Propane, on the other hand, lasts for a long time. An experienced technician could shine a whole floor on a single fill, and perhaps even more afterward. Of course, with any piece of machinery, you’ll experience some issues. In the case of a propane burnisher, the disadvantages are relatively small. A propane unit, due to its increased power may produce more noise. It’s best to wear safety equipment, such as headphones or earplugs, when operated a burnisher. Furthermore, a propane unit should only be used in a well-ventilated area. If you’re using a propane burnisher on commercial flooring and require a refill, contact Northwest Propane by calling 800-274-6121. We provide prompt and competent propane refill services.